Reviews-Day Tuesday is here! It’s been a while since I’ve done reviews, or tutorials, or anything that involves photographing my face, thanks to my mystery allergic reaction. 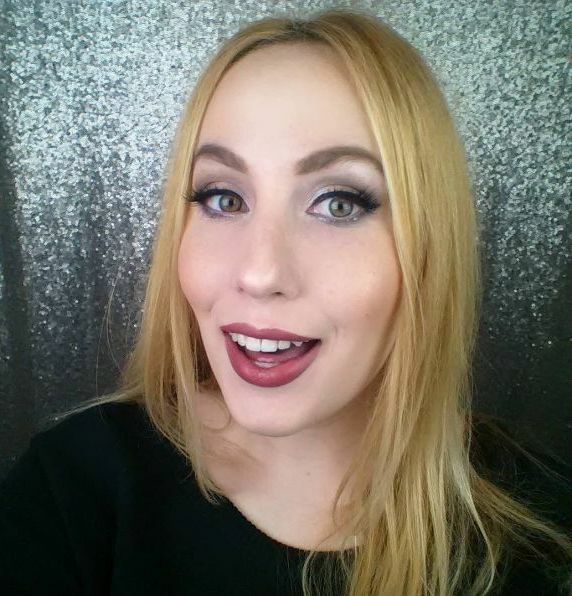 I’ve been itching to do a review, and luckily, my allergic reaction has left the area around my eyes (ugh, it wasn’t fun), so I can review some falsies. 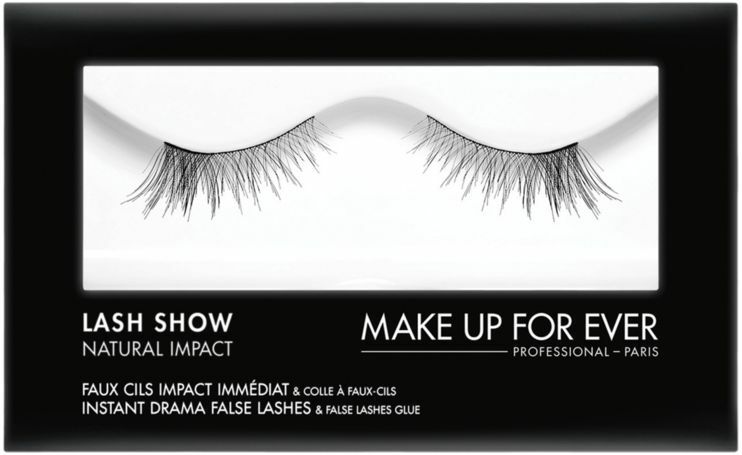 These are the N-403 Lash Show False Lashes* from MAKE UP FOR EVER. Let’s put it to the test! 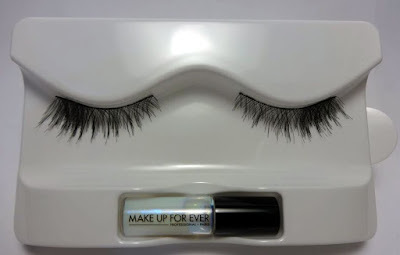 MAKE UP FOR EVER recommends applying a thin coat of mascara to lengthen your natural lashes. 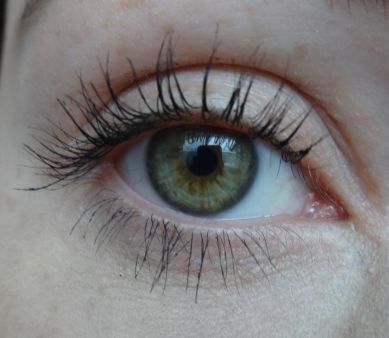 I also like to pre-curl my lashes, so they blend in better with the falsies. It was also recommended to apply eyeliner along the edge of the lashes to conceal the strip, but since there was such a visible gap between my natural lashes and the false lash, I thought it would just draw attention to the poor application job. I’ll be the first one to admit that I am not a false lash aficionado. However, I had a particularly tricky time with these lashes. I applied them with my eyes slightly closed, so the false lashes wouldn’t be pointing upward, however, they still ended up pointing to the sky, which made it look very obvious that I was wearing falsies. I thought that the lashes looked kind of unconvincing, since I couldn’t get certain areas of the band flexible – it made for random pointy corners on the band. I also had a very difficult time getting the ends to stay glued down. 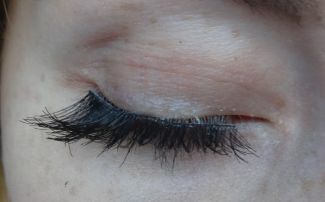 A friend recommended trimming the lashes on each end, so they don’t fly away, and even with a small trim on each end, then glue wouldn’t hold down the lashes on either end, as you can see pictured below. I pressed, and pressed, then added more glue, but nothing worked. What I did like about these lashes was how comfortable they were. 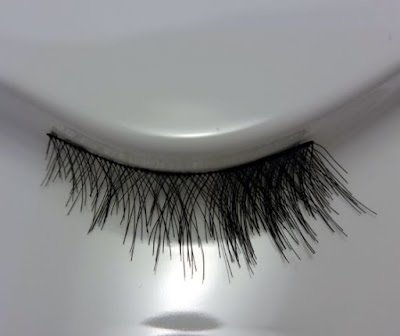 I remember the first time I tried falsies, at first it felt like I had a small elephant on my lash line. 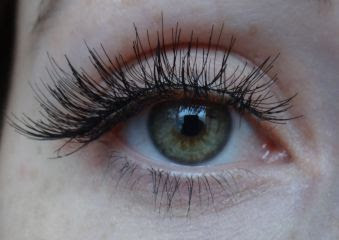 These ones felt very light from the beginning, and never felt like they were poking me, or had any sharp edges (which sometimes happens when I wear falsies). If I were to give any constructive criticism, it would be that I wish that the false lashes tapered off to a point like a natural eyelash, instead of being cut off. You can find Lash Show false lashes at Sephora, Sephora.ca, and MAKE UP FOR EVER Boutiques, for $22.00 each.